Pat Chun has been WSU athletic director for just more than a year and recently received a national award. He says the "best days are really in front of us at Washington State." 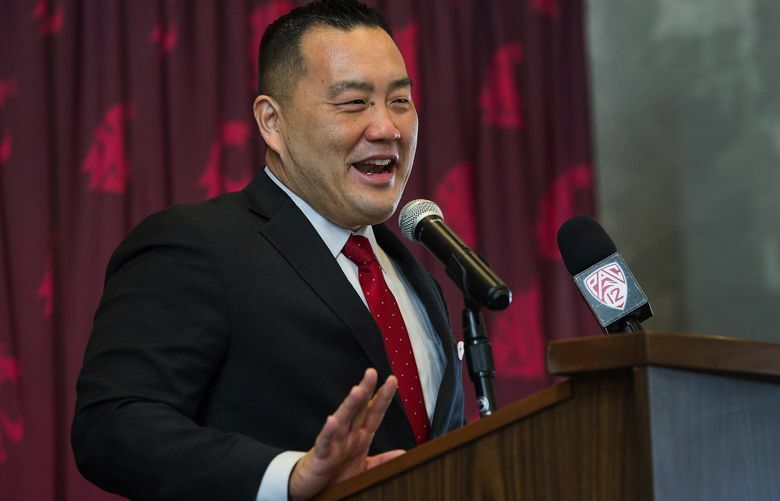 Washington State athletic director Pat Chun likes what Cougar athletics accomplished in his first year on the job, and sees even better things ahead. Last week, Chun was one of four FBS-level athletic directors to win the Under Armour AD of the Year Award. On Saturday, he was in Seattle for A Night With Cougar Football. We sat down with Chun to get his assessment of Cougar athletics, including his thoughts on basketball coach Ernie Kent, how he reacts to rumors regarding football coach Mike Leach and why WSU fans should be excited for the future. This interview has been lightly edited for length and clarity. Seattle Times: Tell us about your first year in Pullman. Chun: The fit has been amazing for me and my family. The community is welcoming, the school district is amazing, so from a family standpoint we’ve adjusted and adapted. There is a beauty to Pullman and a beauty to a small college town that we and I had not been a part of in the journey of my career. It’s been nice to experience that. From an athletic director’s standpoint, two of the most important things you need to have the success that we have had are an extraordinary president like we have, Kirk Schulz, who is renowned in higher education for his work in college athletics, and a future Hall of Famer football coach. That allows you to work on some other things, because the leadership is right at two critical positions. To have stability with the president, the athletic director and the head football coach, is one huge part of our abilities to move the program forward. ST: Talk about starting the job last year just after quarterback Tyler Hilinski died by suicide. Chun: On Day Zero, you have an athletic department and a university and an entire community dealing with a tragedy and have student-athletes have to deal with something that no group of student-athletes should ever have to deal with is one of saddest things that hopefully I will ever be a part of. But from an athletic director’s standpoint, it forces the entire department to get past the superficial; we had to get to work right away. You learn suicide is the second-leading cause of death of college-age kids. We’ve had suicides on our campus before Tyler Hilinski’s passing, and we’ve had suicides after, and it’s trying to figure out what we can do to service the needs of our student-athletes, our campus population. How do we eliminate the risk, how do we get people talking more about suicide, how do we get people to ask for help? Those are things that really forced us to work together, to get to know each other better early on. ST: What are your thoughts on winning the AD of the Year award? Chun: It is really a reflection of our entire athletic program. These awards are done for organizational excellence. No. 1, it’s a true reflection of our student-athletes, coaches and staff, their hard work, their dedication and the environment we are trying to build. And the success we have had has been amazing. We’ve made some history, with volleyball, soccer, cross country and football, with (ESPN) “GameDay,” getting the baseball project approved. There are so many wonderful things that happened. Our athletic fund had a record year. So that is one piece of it. It’s a reflection I believe of President Kirk Schulz and his ability find the people who fit the institution. ST: What does it mean to you to be the first Asian-American AD at a Power Five Conference School? Chun: I was never judged by the ADs that I worked for by my ethnicity, I was judged by the quality of work or lack of quality work. Coming to this community, in the last year, I understand a little bit better the responsibility that that comes with. People reach out to me now, young people in sports, to hear my story or just know that someone else is going down the same path as them. It’s something that is not lost on me. ST: The athletic program has set records for GPA the past two semesters (3.08 and 3.11). What do you attribute that to? Chun: I always say that’s a reflection of our environment and our coaches. Core values is what attracts people. One thing I believe in, and I have made it clear to our coaches, is we are never going to be great if we don’t do what we need to do academically, and compete academically. … We’re trying to find the most competitive people possible who want to wear our jerseys. And that doesn’t show up just on the playing fields. If you are going to compete in the classroom, you’re going to compete in the weight room, you’re going to compete in practice, and the results will be there. ST: The athletic department had a $68 million deficit as of last June. What is your plan to change that? Chun: We have a five-year budget recovery plan. I would argue that we are the most efficient athletic program in the country. We stretch our resources farther, and the results are pretty amazing. In Year One, it is taking a firm evaluation of our staff and retooling our revenue lines. The majority of the changes we have made in athletics have been on the revenue side of the house. It’s our Cougar Athletic Fund, our corporate sponsorships, our marketing, our PR, our branding and social media. Everything is focused on that side of the fence. So it’s going to be a process to get there. We have to sell more tickets to basketball, we’ve got to do more corporate sponsorships. ST: Last year the athletic department received a record $7.6 million in donations. How did you help accomplish this? Chun: There is no rocket science to this. We’re fortunate in a place like this, that people have a lot of pride in Washington State, and people understand how important athletics is to the overall brand of the institution. There is no magic formula, we just have to do a better job at engaging with all our alums and supporters throughout this state and throughout the country and letting them know how giving to Washington State athletics impacts not only student-athletes but how it impacts the entire university. I will make an argument that our brand had a transformational day on October 20 when “GameDay” came. It’s one of those moments in time when we’re never going to be the same the second Rece Davis does that opening, because all of a sudden – fire marshals estimated 30,000 Cougars showed up – this explosion happened on TV, that could not be fabricated. … When those cameras went on, the outpouring of pride for the institution showed up, and that’s who we are. And that’s a pretty wonderful thing. That’s what athletics is supposed to do. We’re supposed to enhance the brand of the institution. ST: What went through your mind when rumors started that football coach Mike Leach might be interested in returning to Texas Tech and did that hasten giving the coach an extension? Chun: Nothing went through my mind. We met early in the week before the Apple Cup, and there may have been a two-minute discussion about extending his contract and that’s being generous. He wants to be at Washington State, he loves it there, he and his wife Sharon have built a life in Pullman and it’s well-documented – his routine of walking to work and going to his coffee shop – and he has built this program to be a reflection of him. This is his life’s work, and as these things pop up there is really no reaction because we knew where Mike stood with all of these with regard to Washington State. The reality is, I expect his name to pop on a lot of these (coaching openings). … You have a guy who is winning at the highest level, who is the most innovative mind in college football and the expectation is that people will continue to knock on his door. ST: How important is it for the overall athletic program that the football team continues playing at the level it has the past few years? Chun: It’s not an option: It has to, and we are keenly aware of that. There in an annual investment to keep football sustainable at this level, and the most important thing will always be the head coach and all the assistant coaches and staff that he puts together. We are one of those institutions where our self-esteem is impacted by what happens on the football field in the fall and part of the responsibility of being at Washington State is to field a highly competitive football team. We are focused on the short-term and long-term health of Washington State football. In this next phase, we’re fundraising for a practice facility. That is the next piece. ST: What are your thoughts on the men’s basketball team, in the midst of another down year, and the future of coach Ernie Kent? Chun: I have been a fan of what Ernie has done behind the scenes, in terms of how he’s tried to develop our program. Our expectations were high on his behalf and my behalf, and we all wanted a different result as the year progressed. … Ernie and I have had discussions throughout the year and we have to get through the Pac-12 tournament and he and I will sit down and figure out what we can do to put Washington State basketball in the best position going forward. ST: How about the baseball program, which has a great history at WSU but has had three straight losing seasons? ST: Give a couple of reasons Cougar fans should be excited about the future of WSU athletics. Chun: No. 1, there is no place like Washington State in this country, and I think that is indicative of what happened on “GameDay” on October 20. That show has been done for two decades, and the most epic show in its history took place in Pullman, Washington. I remind everyone that when Cougs do something, they do it different and they do it better than most places. The people that we continue to attract are amazing people, whether they are coaches or student-athletes and we will continue to build around the great people we continue to attract. No. 2, the sky is so high for Washington State. What we’ve been able to do the past couple of years, and what I think we can do when we get to a more aggressive resources acquisition mind-set. We’ve always been the school that has done more with less, and it’s going to be interesting to see what we can do when we have more (money). There is no better time to be a Coug. … The best days are really in front of us at Washington State.